Southern Rockies Nature Blog: Deception Works! "Wildlife Survey. Please Do Not Disturb." 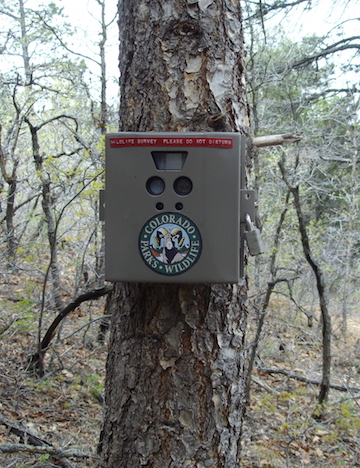 I have a few scout cameras out in the woods most of the year, some on our property, some on nearby BLM or national forest land. This one is about a quarter-mile from the house, on national forest, on a lightly used game trail that no one ever travels on two legs, as far as I can tell. It has produced some of my best bear photos. "Is that a Chesapeake?" he asks as he is being sniffed, thus establishing himself as a Friend of Dawg. We chat a moment, then a younger man walks down the road, also with a bow. It turns out that they are father and son, from a little town to the south. They are hunting deer but don't know this area well, so it's partly a scouting trip. The son got close to some, but not close enough to loose an arrow. "I went up this little drainage," he says, "and I saw this CPW scout camera . . ."
I am biting my tongue. What I said about no one going into the woods at that location? I was wrong. But the son not only buys into my camera's "camouflage," he is convinced that its presence means that this is a good deer area. After all, while standing by the camera, he heard a twig snap. It's true that Colorado Parks and Wildlife has done some deer research nearby, but it's more of the tranquilizing-and-radio-collaring variety, not with scout cameras. I could plead no-contest to impersonating a state government camera. Having had one stolen, I will take the risk. I am mostly just laughing at myself at this point. Never say never.